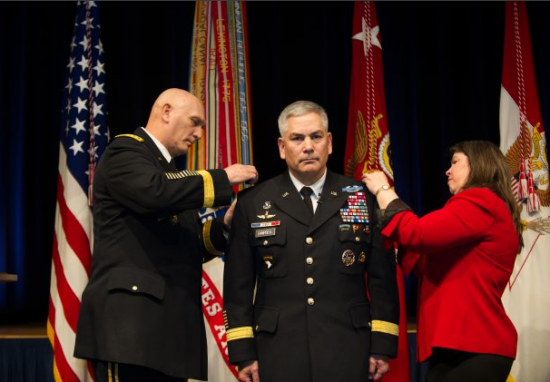 WASHINGTON – Gen. John F. Campbell, Army vice chief of staff, told the U.S. Senate Committee on Armed Services on July 10 that he would provide his “true assessment” of the situation in Afghanistan as he begins the process of withdrawing American combat troops. Campbell, currently the highest-ranking military leader of Japanese ancestry in the U.S. Army, is seeking confirmation of his nomination by President Obama to serve as commander of NATO’s International Security Assistance Force (ISAF) and U.S. Forces in Afghanistan. “If confirmed, I will proudly lead our men and women in Afghanistan,” Campbell stated. During the hearing, committee members, including Sen. John McCain (R-Ariz.), repeatedly pressed Campbell on whether he supported Obama’s timetable, which calls for a reduction of U.S. troop presence in Afghanistan from approximately 32,000 today to 9,800 by the beginning of 2015 and further reduction through 2016. Campbell pledged to update the committee regularly and “give my true assessment of what I see on the ground.” At the same time, he expressed confidence in the capability of the Afghan security forces that have been trained, advised, and improved by the American military. When Campbell received his fourth star in March 2013, he became the second Japanese American to achieve that distinction. The first was Gen. Eric Shinseki, U.S. Army (retired), former U.S. secretary of veterans affairs. Campbell was serving as the Army commanding general in Afghanistan when the Navy Special Operations SEAL Team 6 tracked down and killed Al Qaeda’s Osama Bin Laden. Rivera dubbed him “America’s Spartan” — a reference to the elite warriors from ancient Greece trained from infancy. Indeed, Campbell, the son of Air Force Senior Master Sgt. Ernie and Kyoko Campbell of Fairfield in Northern California, became accustomed to military life while growing up on bases around the world. Speaking before a gathering of the Asian American Government Executive Network (AAGEN) recently, he credited his mother for instilling in him the values of hard work and preparation as keys to success. He recalled how his parents made sure he and his sister did their homework each night before going to bed. “There are a lot of things you can’t control in life, but one thing is self-accountability,” he added. Campbell said that the 10 Medal of Honor recipients who fought in Iraq and Afghanistan continue to have a great influence on him. He was also inspired, he said, by the late U.S. Sen. Daniel Inouye, who served with the 442nd Regimental Combat Team during World War II, a time when Japanese Americans were often looked at with suspicion. Campbell has earned numerous decorations in his own right, including the Distinguished Service Medal, the Defense Superior Service Medal, two Legions of Merit, three Bronze Star Medals, two Defense Meritorious Service Medals, six Meritorious Service Medals, and more. Campbell graduated from Fairfield High School in a community near Sacramento. He attended the U.S. Military Academy at West Point, graduating in 1979 with a bachelor of science degree and a commission in the Infantry. He later earned a master’s degree in public administration from Golden Gate University in San Francisco. He was also a professor of military science at UC Davis. His wife, Ann, guides the volunteer-led Army Family Readiness Groups (FRG) and has become a dedicated advocate for soldiers, their families, veterans, and wounded warriors. She is also on the board of Centerstone Military Services, which offers online counseling and support to soldiers and their families through a program called Courage Beyond. Gen. and Mrs. Campbell have two children, Jennifer and John Jr. Despite concerns over the president’s announced timetable, the senators are expected to confirm Campbell. “You’re the right person to meet that challenge,” commented Sen. Saxby Chambliss (R-Ga.).